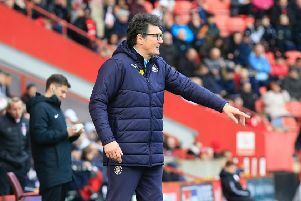 The Hatters have one foot firmly in League One after they beat Crewe Alexandra at Kenilworth Road this afternoon, racking up a third successive victory. Town had to do it the hard way once more, falling behind in the first half, but as they had against Mansfield, they did just that, Danny Hylton levelling, before Elliot Lee and Pelly-Ruddock Mpanzu netted stunning strikes to secure the turnaround win. Results elsewhere made it an even better afternoon's work, with leaders Accrington held by fourth-placed Exeter, while Lincoln's defeat to Port Vale, means the Hatters could be promoted in midweek, should the Grecians lose at home to Chesterfield. An unchanged Luton made a fine start to proceedings with Olly Lee seeing plenty of the ball, as after both he and Hylton had shots blocked, Jack Stacey found space from James Collins' cross, heading at Ben Garratt. Hylton opted to try his luck first time from Collins' knock down, flashing wide from just outside the box. Town's leading scorer then gave away a free kick on the edge of the area which Harry Pickering curled goalwards, but James Shea, who hadn't moved from his position by the post, parried comfortably. Hylton then broke well, finding Elliot Lee, the striker left with little on but to have a go from 20 yards, missing the target by inches. Town almost fell behind in calamitous fashion on 20 minutes as Shea couldn't collect a cross, Rea back in time to prevent the ball going over the line, only to strike his clearance against the prostrate Alan Sheehan, watching it fortunately go behind. The visitors did take the lead on 35 minutes when Sheehan dived in to try and win the ball before it reached Jordan Bowery only to miss it completely leaving the former Aston Villa striker with a clean run on goal from 50 yards. He took his opportunity with real class, drawing Shea and putting the ball through the keeper's legs. Determined to hit back, Sheehan almost made amends instantly, seeing a free kick turned away by Garratt, and Dan Potts' close range effort was blocked by a frantic Alex back-line. Luton were level just four minutes later, when Sheehan's corner was won by McCormack for Hylton to swivel and hammer in his 22nd of the season. Sheehan had another set-piece which was easy for Garratt, while Elliot Lee was crowded out, just, while a covering defender stuck out a boot in the nick of time to stop Hylton from making it 2-1. Luton piled on the pressure though and had the lead on the stroke of half time, Mpanzu beginning an attack which eventually found Elliot Lee. He used Potts' overlap as a decoy, and cut inside to curl an absolute pearler beyond the outstretched Garratt and into the top corner for a wonderful strike. That was the perfect tonic for Town and they began the second half looking to kill the game off, which they appeared to have done in truly spectacular fashion just six minutes in. Sheehan's corner was headed out to Mpanzu situated 30 yards from goal who took a touch, steadied himself, and unleashed an absolute thunderbolt which rocketed into the top corner for his first goal of the campaign, also making it every outfield player bar the January deadline day signings to have scored for Town this season. Both sides then played with a carefree abandon, as Stacey could have sealed it, his effort going across the face with Hylton well placed, while sub Harry Cornick's dogged determination saw him set up Collins, Alex blocking his effort behind, Sheehan's delicious set-piece clipping the outside of the post too. Cornick himself should have made it 4-1, dragging wide after Mpanzu's dogged and determined run, but Crewe weren't without their opportunities, Shea smartly collecting Bowery's volley. The final five minutes saw Town look increasingly jittery at the back though, Shea spilling a few crosses and the hosts having to throw their bodies in the way of a host of chances. Try as they might, Alex couldn't quite reduce the deficit, meaning the next time Hatters are back at Kenilworth Road, it should be for a promotion party. Hatters: James Shea, Jack Stacey, Dan Potts, Glen Rea, Alan Sheehan (C), Alan McCormack, Pelly-Ruddock Mpanzu, Olly Lee, Elliot Lee (Harry Cornick 64), Danny Hylton (Johnny Mullins 85), James Collins. Subs not used: Marek Stech, James Justin, Flynn Downes, Luke Gambin, Jake Jervis. Crewe: Ben Garratt, Perry Ng, George Ray (C), James Jones, Jordan Bowery, Eddie Nolan, Ryan Wintle, Harry Pickering, Charlie Kirk (Callum Ainly 57), Paul Green (Chris Dagnall 77), Shaun Miller (Chris Porter 57). Subs not used: Brad Walker, Dave Richards, Tom Lowery, Jamie Stacey. Booked: McCormack 31, Green 41, Hylton 69, Dagnall 88.